575 slot machines - .01 to $5. Bingo - see our Cities of Gold Bingo page for information. 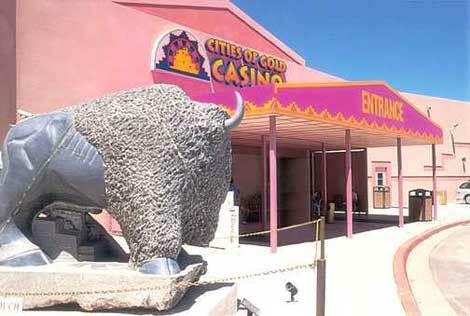 This is a mini casino and simulcast race book located one half mile south of the Cities of Gold Casino and 15 miles north of Santa Fe on Hwy 84/285. A shuttle bus connects the two casinos. The mini-casino features 150 slot machines and a race book with simulcast TV for wagering on horse and greyhound racing. Doors are open at 10am daily and close at 2am Fri & Sat and midnight Sun-Thu. The Sports Bar Race Book and Casino will soon move to the Hilton Santa Fe Buffalo Thunder Resort & Casino. We will update that information our	Thunder Race Book page. The Cities of Gold Hotel includes a full service restaurant with room service, an outdoor cantina, and the Cities of Gold Hotel Conference Center with 6,600 sq. ft. of meeting space.